Animal health is key at Kepak Farm, which is one of the reasons it is one of Ireland’s most efficient beef finishing units. Katie Jones visited to find out more. Daily liveweight gains are targeted at 1.7kg/day for bulls and 1.3kg/day for heifers. The 320-hectare (790-acre) Kepak farm, located in Dunboyne, Co Meath, operates a beef finishing enterprise, finishing about 3,500 animals yearly. The farm is owned by the Kepak group, one of Ireland’s leading meat processors, and not only provides one of Kepak’s nearby manufacturing plants with a very small part of their total weekly kill, but also acts as a knowledge transfer centre. Here, they collaborate with farmers to share best management practices designed to produce top quality beef for their customers. At the core of the farm’s efficiency and sustainability targets is the focus on animal health, with protocols in place to ensure mortality is kept to a minimum. Sam Myles, farm manager, explains about 60 per cent of the cattle are now bought direct from farms in a bid to keep exposure to disease and stress to a minimum. “We are buying-in 60-70 animals a week, mainly continental types from suckler herds, and are buying bulls at 10-14 months of age and heifers at 12-24 months. Sam Myles is farm manager at Kepak Farm Co Meath. Once on the farm all the animals go into a quarantine area for about 48 hours, which Mr Myles explains gives them time to get over the transportation period and also get used to their new surroundings and social groups. During this time all the cattle are vaccinated for pneumonia and colstridial diseases and given a fluke treatment. This focus on health has meant mortality rates on the farm last year was just 0.4 per cent. All the cattle have their backs and tails clipped and are fitted with a management eartag and weighed. The target daily liveweight gain is 1.7kg/day for bulls, and 1.3kg/day for heifers and cattle are on-farm for about 90-120 days depending on customers’ finishing requirements. Most of the bulls slaughtered under 16 months are at a target of 350-400kg deadweight. Most of the heifers are slaughtered at about 22 months of age. It is not unusual for cattle in Ireland to be slaughtered at 24-30 months of age. Most of the heifers are housed on concrete slats, and the bulls on rubber matting. The bulls are kept in the same, smaller groups, for the entire finishing period to avoid having to mix them with other groups. 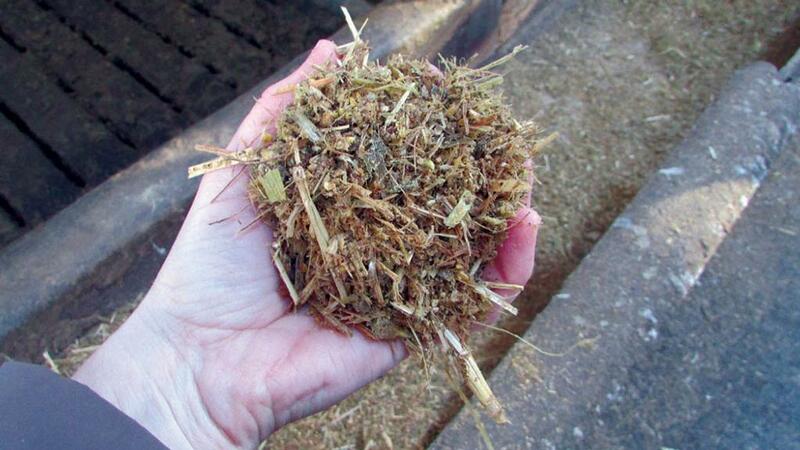 On arrival all the cattle are offered an initial diet which comprises longer-cut grass silage and hay. They will then go onto a gradual ‘build up’ diet, with increasing amounts of the finishing diet fed along with grass silage. By the end of week three bulls are on the full maize silage-based finishing ration, with heifers given 50 days to build up to their finishing diet. One member of staff goes round all the sheds each day to check on the stock, and also to make sure feed bunks are as they should be. “We are looking at the feed bunks to make sure we are feeding them the right amount, but also if there is a lot of feed being left in there, there might be an underlying health problem,” says Mr Myles. As well as keeping an eye on what is being left, the team is also closely monitoring what is being fed. “There are more than 100 pens of cattle, so we need to know exactly what we are feeding each pen and we can make adjustments to what is being fed out. The ration is put out once-a-day, and takes about three to four hours, with the Keenan mixing eight loads a day."